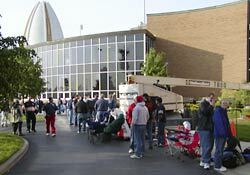 A line that stretched hundreds deep greeted Hall of Fame staff when they arrived for work on Saturday morning. 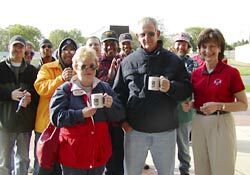 Hall of Fame Vice President Judy Kuntz presented cups of coffee in commemorative 40th Anniversary mugs to Kathie and Ron Steffee (upper left). 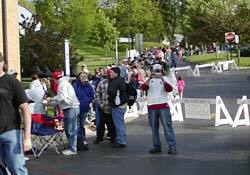 The couple from Canal Fulton, Ohio arrived at the Hall of Fame at 11:30 last night to be first in line for today's Best of Yesterday and Today festivities. 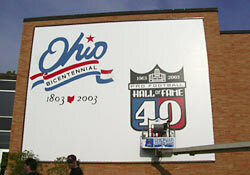 Meanwhile painter Scott Hagan continues to work on the 30'x38' canvas that hangs from the side of the Hall of Fame.